From the Depths, I cry out to you my Lord! It is possible and indeed not unreasonable to see Japan's criminal justice system as suffering from a split personality. On the one side there is the police force -- reactive, laconic (some might say lazy), non-judgmental ("The person was found stabbed, shot in the back, chained and handcuffed inside the locked trunk of a car at the bottom of a local reservoir. Police are investigating the possibility the deceased was involved in some sort of trouble...") and otherwise preoccupied with watching the world go by. Before reading Adelstein's piece, I considered the inert and relentless faces of criminal investigation independent aspects of a cultural dichotomy. Upon reading Adelstein's account, however, both the inactive and active aspects of the law seem facets of a not illogical unified whole. Having a police force and courts who most of the time refuse to involve themselves in the affairs of the citizens but when they do engage themselves they do so with a reprehensible zeal sets the base conditions for a stable, low cost equilibrium. If the state were to apply its crime investigation methods equally to the entire populace, the cost of prosecution and incarceration would be Himalayan, much of the population would be in jail and those still free would see the police and the courts as evil. However, by selectively, infrequently but merciless applying themselves to cases, the police and the courts create strong incentives for the citizens to police themselves, if only to stay out of harm's way. A police officer does not need to be on every corner, nor does every complaint need to be followed up. Instead, just take a thin slice of the cases and act upon them with blind, vengeful determination. The citizens will take note of what happens to those who become trapped in the pit of the law (don't call it "justice") system and will strive, of their own volition, to never, ever becoming trapped in that system themselves. Later - A Journal of Legal Studies article focusing on the conviction rate coming to the same conclusion as to costs (Link). However, the authors see the low budget for prosecution as a bug, not a feature. In discussions of his article on Facebook, Jake Adelstein notes that the current system has difficulty prosecuting cases where the criminal refuses to confess and physical evidence or eyewitness testimony is poor. Low cost implies tradeoffs and this is one of them. 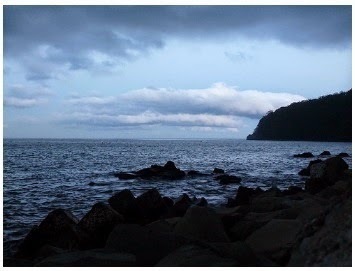 Photo image: Nightfall in Manazuru, Kanagawa Prefecture on February 23, 2012. Pretty much a you write, methinks. I would only hope, dream. or drunkenly fantasize that the mere existence of that article may someday give pause to the "experts" who, when writing about Japan's criminal justice system or crime rate, begin with "It's difficult to compare crime rates between countries due to..." and then proceed to do so. I will quibble a bit with calling Tokyo Koban sitters "reactive" as this word overstates their "enforcement" of various laws. Sorry for so many sarcastic quotation marks, but note that I did not put any around Japan's criminal justice system. Because I forgot.